All through October, Alphabet Soup is celebrating turning three. 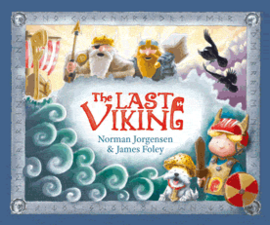 We have heaps of writers and illustrators stopping by to answer THREE QUICK QUESTIONS and today’s visitor is James Foley, illustrator of picture book The Last Viking (by Norman Jorgensen). 1. Where do you like to draw? My favourite place to draw is in my room, really early in the morning, while it’s still quiet, before the pets wake up … penguins can be very noisy when they’re hungry, and spider monkeys are incredibly grouchy until they’ve had a cup of tea and some toast. 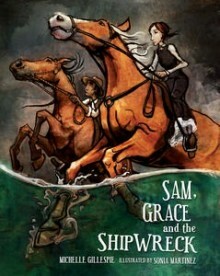 Sam, Grace and the Shipwreck written by new author Michelle Gillespie, illustrated by the incredibly talented Sonia Martinez. It’s coming out this month (October) and looks amazing. It’s the true story of how Sam Isaacs and Grace Bussell saved the crew and passengers of the Georgette when it was wrecked off the South West coast of WA a long time ago. Find out more about James Foley and his books—visit his website and check out the official Last Viking blog. Looks like I’ve got a few new books to track down.